Swaminarayan Akshardham Temple is located on the banks of River Yamuna. The temple is a timeless reflection of ancient Indian culture with all its breathtaking grandeur and beauty. 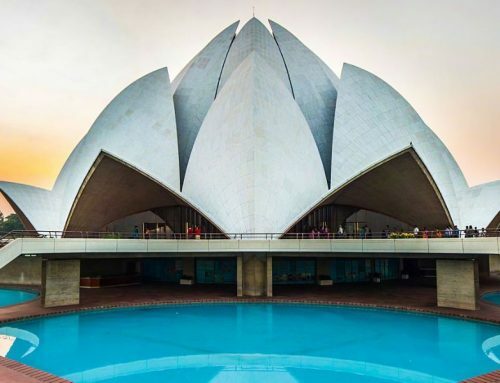 The grand temple showcases India’s ancient architecture, traditions and spirituality. The main monument, depicting ancient Indian “vastu shastra” and architecture, is a marvel in pink sandstone and white marble that is 141 feet high, 316 feet wide and 370 feet long with 234 ornate pillars, over 20,000 sculptures and statues of deities, eleven 72-foot-high huge domes (mandapams) and decorative arches. And like a necklace, a double-storied parikrama of red sandstone encircles the monuments with over 155 small domes and 1,160 pillars. The whole monument rises on the shoulders of 148 huge elephants with 11-feet tall panchdhatu statue of Swaminarayan presiding over the structure.